Cacoxenite etc. plate as removed from the quarry wall. 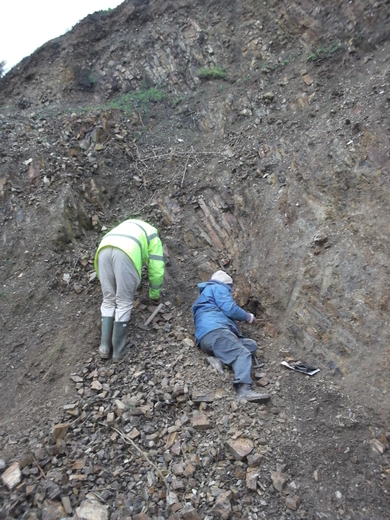 This small, private quarry, occasionally worked for aggregates lies in the uppermost unit of the Codden Hill Cherts. The rock here varies between friable and moderately competent, and is intensely fractured. The largely carbonate depleted mud and siltstones contain occasional fossils and frequent, lenticular phosphatic nodules (presumably coprolites comprising mainly fish bones and chitin) many of which have undergone variable dissolution. 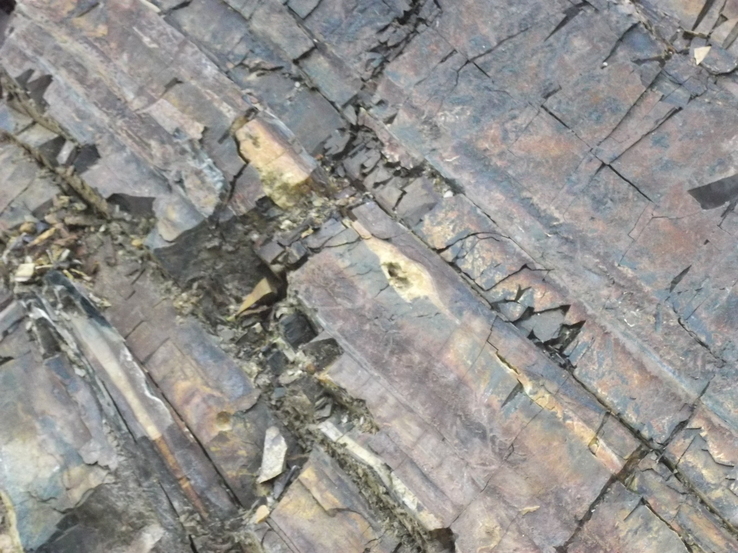 The rock is variously stained with red, yellow and brown iron oxides/hydroxides; dendritic manganese minerals are frequent. In parts, the quarry exhibits very local and intense phosphate mineralisation. The quarry is occasionally worked for aggregate. The farmer who owns the quarry lives nearby and he will ask anyone who has not asked permission to leave. Description: Cacoxenite is found as a bright yellow encrustation in fractures in the rock of the quarry, often in association with porous quartz veins. Where it is found, it is locally abundant but is absent through most of the quarry. 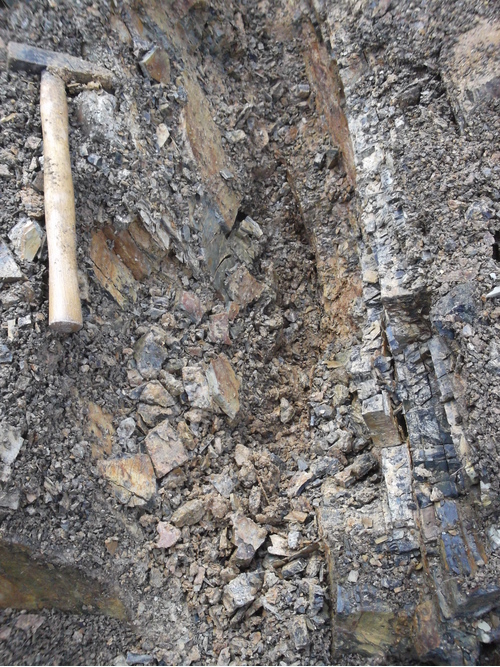 Larger plates showing the phosphatic mineralisation vary across the suface between clove-brown and bright yellow, occasionally to orange and red. The cacoxenite is generally between a deep yellow-brown and bright yellow. Description: Some reddish-brown areas of a small number of specimens show the bladed forms resembling those of eleonorite. Further work is required for confirmation. Habit: Dendritic - coarsely crystalline to lacy dendritic encrustations. 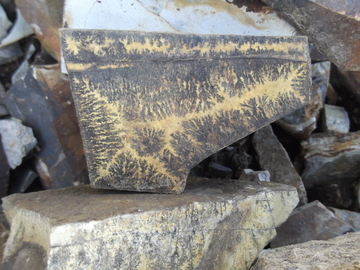 Description: The development of manganese dendrites is particularly varied in this quarry - ranging from coarse, tangible crystals infilling fracture voids down to delicate, mossy developments across the siltstone surfaces. In places, these developments do present a particular aesthetic appeal. 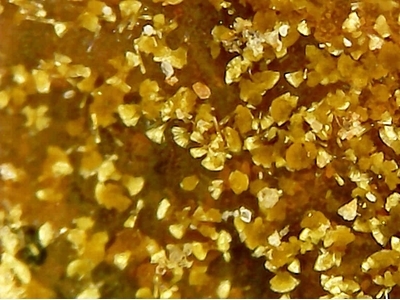 Description: A few areas of phosphatic encrustation show the colour and approximate form of metavivianite. Further work is required. Description: Redeposited silica tubes formed in cracks in the Codden Hill Cherts which host a number of phosphate species. 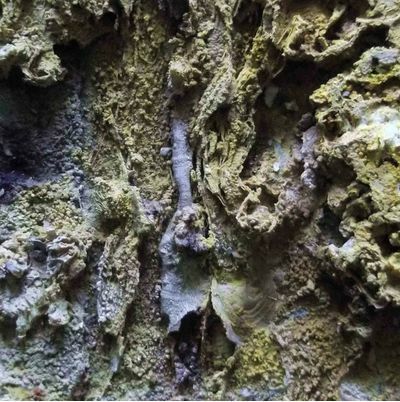 These thin-walled tubes appear to have formed in much the same way as speleothem 'straws', and various walls and ramifications appear across the rock surfaces. These same cracks also play host to the various phosphate minerals found at this location. Description: Areas of purple phosphatic encrustations strongly resemble strengite. Description: Tiny, pale hemispheres and white encrustations have been tentatively placed as variscite. 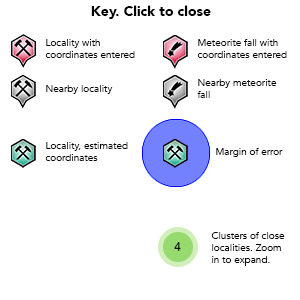 Variscite has been previously reported (unconfirmed) from this location. Description: Small clusters of generally dark hemispheres lining a cavity formerly filled with phosphatic clay. Other minerals peresent in this specimen are manganese oxides, cacoxenite and other unidentified (phosphate) minerals. 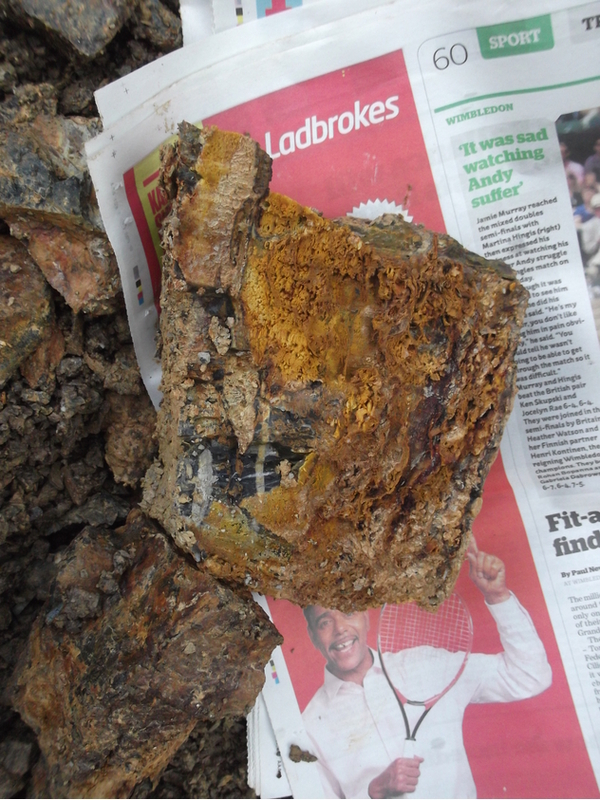 The specimen was removed in the process of extracting cacoxenite plates from the quarry wall.